Straight out of the box, the color accuracy of the HP leaves a disappointing taste. The average dE is close to 9, and the grayscale is well up there, almost entirely in the double digits. Due to the lack of an OSD or other controls, there isn’t any other color mode you can select, such as sRGB or 6500K, to try to improve these results without calibration. 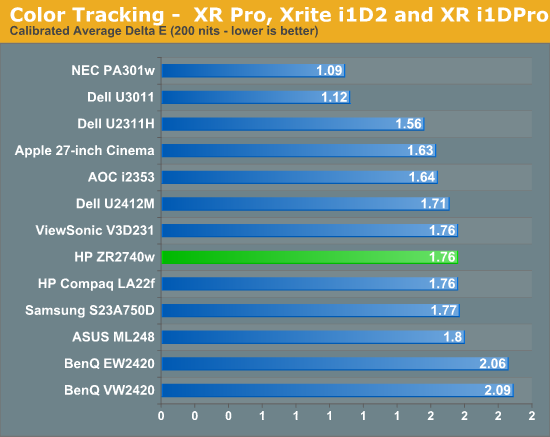 If you purchase the ZR2740w and cannot calibrate it, this is the performance you can expect with no way to improve upon it at all. Of course, since many people purchasing this display will be calibrating it, we want to see how well it performs after a calibration. Using ColorEyes Display Pro on a MacBook Air, I set the targets to my usual preferences: 200 nits of light output, a D65 white point, gamma of 2.2, and minimum black level. The calibration was done with an i1Pro spectrometer that is NIST certified to have a maximum error of 1.0 dE and an average error of 0.4. Using these settings, we get a much better result out of the HP. Here we can see that our dE has dropped down to an average of 1.76 which is pretty good. The errors, as usual, are in shades of blue at the edge of the sRGB colorspace, and that grayscale that was horrible is now down to an error of under 1 for almost the entire range. Again I wanted to look at the median color error and see how much this average error is being skewed by the blue results. Our median color error is a dE of 1.2, which is quite good. There are a lot of panels that do worse than that, and not many that can do much better at all. The only way to really get an error much better than this is to find a panel that uses the full AdobeRGB colorspace, so those shades of blue will be able to be rendered correctly. 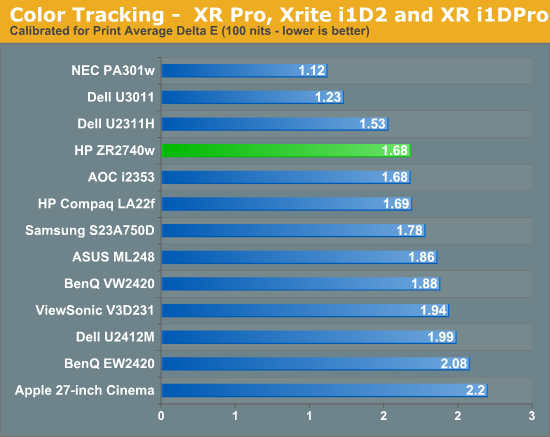 As a high resolution 27” monitor is likely to be targeted towards professionals, including those doing print work, the 100 nits results were even more important this time than usual. 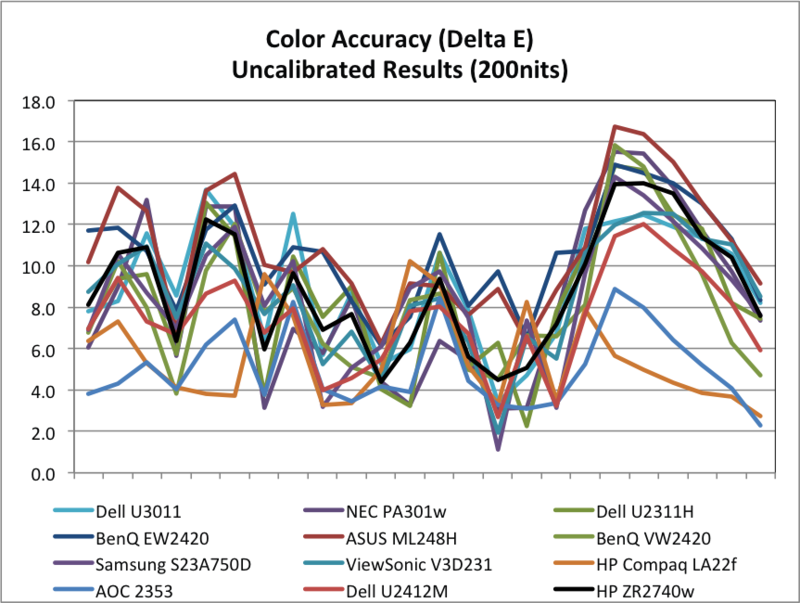 The dE results are very similar to those with 200 nits of light output, down to the grayscale having similar errors across the spectrum. The worst grayscale patch is the dark gray, which is the hardest for the i1Pro to read accurately, but until I have a better calibration program that allows for meter profiling, it’s the best result I’ll be able to get for you. 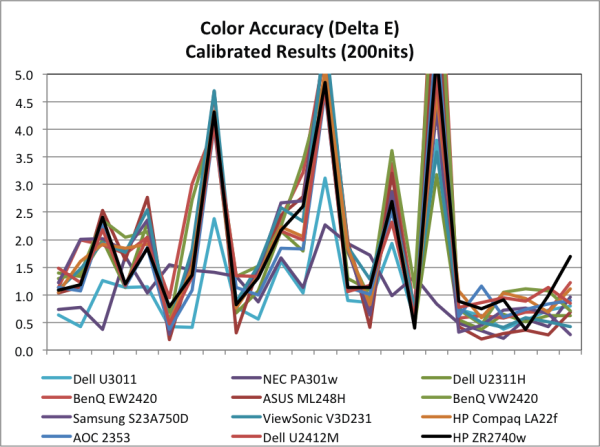 Overall the calibrated results for the HP are good, but with no OSD at all the only way to get even close to these is with a calibration package, since you can’t even copy settings from another display and hope they look OK on your monitor. 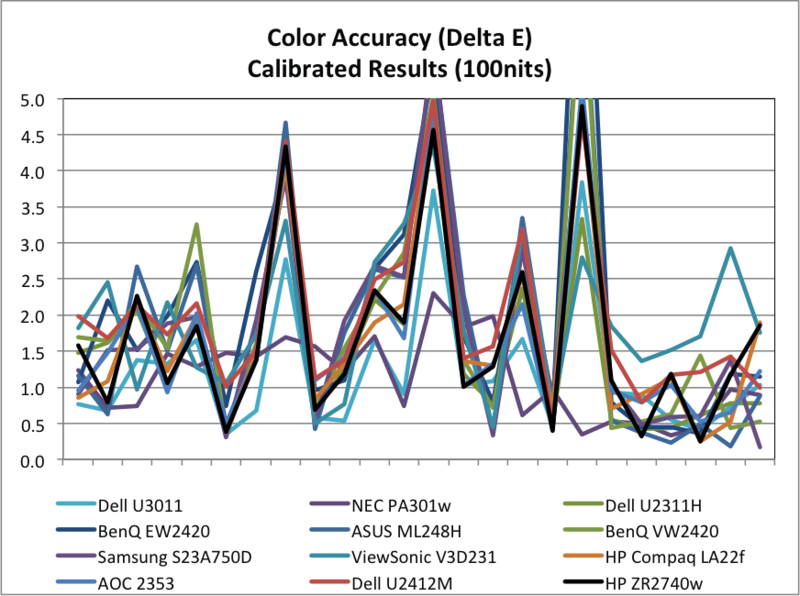 You could always try copying a color profile from someone else with the same monitor, but even then you're likely to get significant errors as there's plenty of variance between otherwise "identical" panels. Please define "terrible", because in my experience less than a frame of lag is nothing. 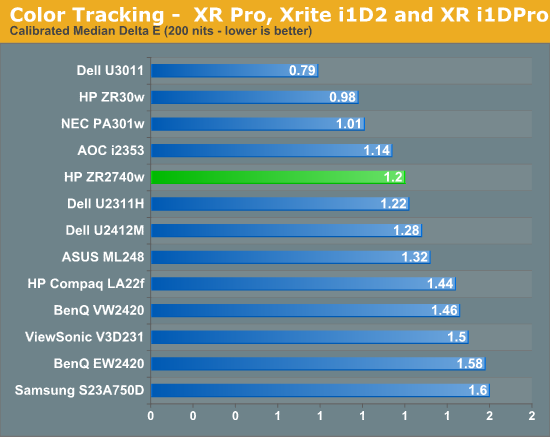 I have an older S-PVA (Dell 2408WFP) with about three frames of lag. My personal threshold is around 20ms before it starts getting bad, relative to an S-IPS 30" display. Based on Chris' measurements I would guess I could get away with ~35ms delay relative to a CRT. the U2711 retails for the same price as the ZR2740w. That's a full $200 more than what we can find the ZR2740w selling for, and it's not all sunshine and roses for the U2711. It has excellent colors, more connectivity options... and more input lag/processing lag. 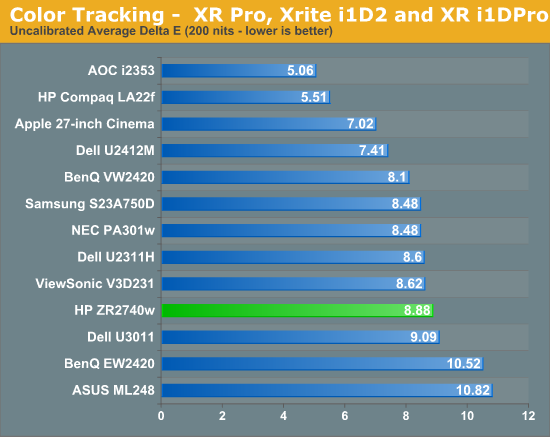 Tom's Hardware measured lag at 98ms (http://www.tomshardware.com/reviews/ultrasharp-u27... but I measured it at just 16-18ms (http://www.anandtech.com/show/2922/4). I'm not sure which is "right", so I'll leave that to you. Please don't confuse refresh rate and input lag. Input lag means the time for a pixel on the wire to be shown on screen. If a monitor waits for a whole image before refreshing it's panel, then yes, you will have 16ms input lag. But this will be for the top-left pixel. The bottom-right will be less, as the panel refresh nowadays is much faster than accepted refresh rate. And 0 input+processing lag is desireable for any fast-paced action. It's not useless, it's ideal. And don't forget also the rendering time. Input lag is only as bad as the person who uses the monitor notices.